IP subnetting creates vastly larger numbers of smaller groups of IP addresses, compared with simply using Class A, B, and C conventions. The Class A, B, and C rules still exist—but now a single Class A, B, or C network can be subdivided into many smaller groups. Subnetting treats a subdivision of a single Class A, B, or C network as if it were a network itself. By doing so, a single Class A, B, or C network can be subdivided into many nonoverlapping subnets. Figures 12-2 and 12-3 show the basic differences between a network that does not use subnetting and one that does use subneting. 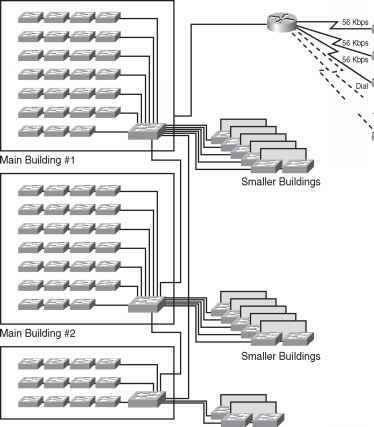 First, look at Figure 12-2, which uses six different IP networks. The design in Figure 12-2 requires six groups, each of which is a Class B network. The four LANs each use a single Class B network. In other words, the LANs attached to Routers A, B, C, and D are each a separate network. Additionally, the two serial interfaces composing the point-to-point serial link between Routers C and D use the same network because these two interfaces are not separated by a router. 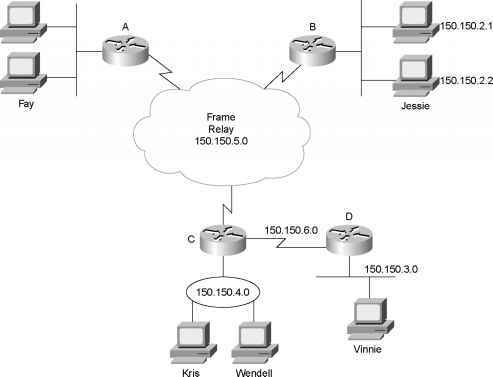 Finally, the three router interfaces composing the Frame Relay network with Routers A, B, and C are not separated by an IP router and would compose the sixth network. 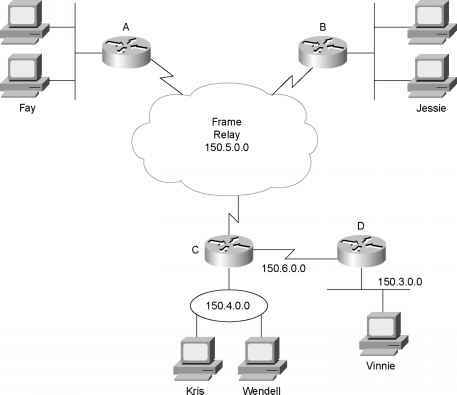 CAUTION Other Frame Relay IP addressing options would require one or two more IP network numbers for this physical network. As in Figure 12-2, the design in Figure 12-3 requires six groups. Unlike Figure 12-2, Figure 12-3 uses six subnets, each of which is a subnet of a single Class B network. This design subnets Class B network 150.150.0.0. The IP network designer has chosen a mask of 255.255.255.0, the last octet of which implies 8 host bits. Because it is a Class B network, there are 16 network bits. Therefore, there are 8 subnet bits, which happen to be bits 17 through 24—in other words, the third octet. Note that the network part (the first two octets in this example) all begin with 150.150, meaning that each of the six subnets is a subnet of Class B network 150.150.0.0. When subnetting, a third part of an IP address appears in the middle of the address—namely, the subnet part of the address. This field is created by "stealing" or "borrowing" bits from the host part of the address. The size of the network part of the address never shrinks—in other words, Class A, B, and C rules still apply when defining the size of the network part of an address. However, the host part of the address shrinks to make room for the subnet part of the address. Figure 12-4 shows the format of addresses when subnetting.